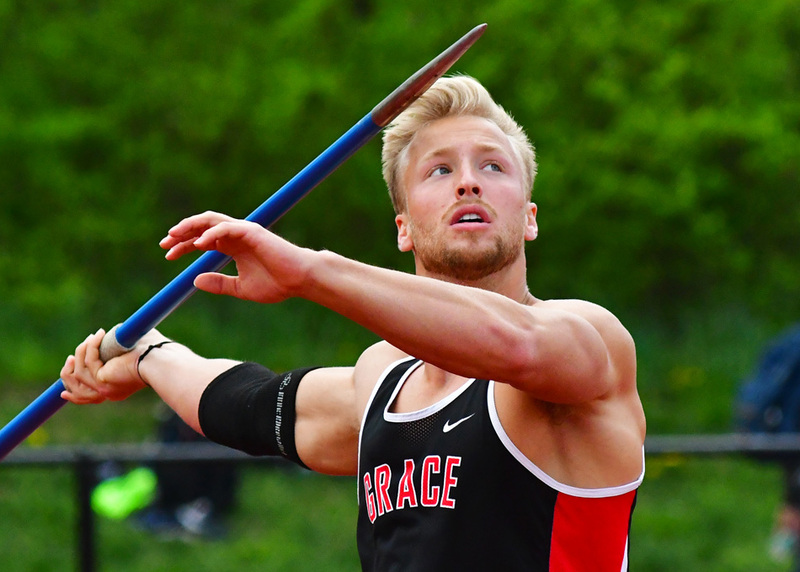 Grace’s track and field team officially opened up the outdoor season on Saturday with the IWU Polar Bear Invitational. Thomas Hickerson tossed the javelin 183-feet-2 on his first throw of the season and finished second in the meet. His throw qualifies him to compete at the NAIA National Championships in May. Isaac Brown, who impressed during the indoor season as an NAIA qualifier, also hit the NAIA outdoor standard in the high jump on Saturday. The freshman cleared 6-7.5 to win the event by four inches. Nordia Campbell had a pair of strong showings. She was second in the 100-meter dash at 12.84 seconds and third in the 200 at 26.58. Paul Brawner was nearly identical, taking second in the 100 dash (11.23) and fourth in the 200 (22.90). Dylan Felger was the runner-up in the 400 hurdles at 56.64, and Kyle Smith was fourth in the 800 at 1:57.14. Felger and Smith teamed up with Brady Willard and Brendan Hamilton to place third in the 4×400 relay in a time of 3:26.16. Abbott Joy finished fourth in the javelin (162-2), and Bethany Hoffman finished ninth in the women’s javelin (91-8). Walker Hobbs finished sixth in the shot put. Kaitlyn Mack picked up a fourth-place showing in the 400 hurdles at 1:09.77, and Julia Malson finished seventh in the 200 (27.47). The Lancers will next compete at the Hanover Invitational on March 30. Grace’s softball team was unable to take a game from Taylor on the road on Saturday. The Lady Lancers lost 0-6 and 0-8 to the Trojans (11-4, 3-0 Crossroads League). In the opening game, Grace foiled multiple chances to upend the Trojans, despite the 6-0 scoreline. Grace had seven hits compared to eight for Taylor; but the Lady Lancers stranded eight baserunners and let Taylor get hot for two innings. The Trojans scored three runs in both the fourth and sixth innings to secure the win. In the top of the second inning, Grace had a baserunner on third base. In the top of the fifth, Grace had three baserunners who were unable to cross home plate. The Lady Lancers had the bases loaded in the top of the seventh after pinch-hit singles by Hannah Middlebrooks and Hannah Harless as well as a walk by Taylor Asher. But Grace again came up empty in its final chance. Morgan Tapscott was a bright spot offensively, going 3-of-3 from the plate. The second game was run-shortened. Grace had a pair of baserunners stranded in the third inning and two more in the fifth inning; either chance could have given the Lady Lancers momentum, but both innings ended without a Grace run. Erin Lawhon hit 1-of-1, and Andrea Castillo, Tapscott and Jessica Kaurich each had a hit. The Lady Lancers will aim to rebound on Tuesday with a doubleheader at Spring Arbor. Grace’s baseball team could not convert on its chances in a 4-2 defeat at Spring Arbor on Saturday. The day originally called for a doubleheader at SAU, but poor field conditions resulted in Saturday being a single 9-inning affair instead. The Lancers equalled the Cougars on hits (9-9) and even had one fewer error (2-1), but Grace could only turn its nine hits into two runs. The Cougars led early and held on late for the win. The Cougars (9-18, 2-5 Crossroads League) scored a single run in the first, second and third innings. The Lancers (7-7, 3-4 CL) were unable to produce a threatening inning during the first three frames, but Grace’s bats soon warmed. Houston Haney had a leadoff double in the fourth inning that did not convert to a run, and Grace had two base hits in the fifth that also came up empty. In the top of the eighth, Grace got on the scoreboard. Hunter Ackerman doubled to put two runners in scoring position, and Mitchell Enyart produced a two-out, two-run single to the outfield to chop SAU’s lead in half 4-2. But the Lancers could only generate one more single from RJ Snyder for the rest of the contest to fall by two. Altogether Grace left 10 baserunners stranded in the game compared to just five for the Cougars. The freshman duo of Jacob Sapp and Sam Newkirk both hit 2-for-4, and Haney hit 2-of-5. Ackerman was 1-for-4 with a run, and Enyart finished 1-for-4 with two RBIs. Josh Tew tossed the first 6.2 innings, yielding eight hits and four runs with five strikeouts. Ike Peterson threw the last 1.1 innings and only surrendered one hit in relief. The Lancers will end the series at Spring Arbor on Monday.